UF College of Pharmacy student Elizabeth Shald presents her team’s poster at the Neurocritical Care Society Annual Meeting in Boca Raton. A literature review led by four University of Florida College of Pharmacy students addressing the wide variety of pharmacological treatment options for Paroxysmal Sympathetic Hyperactivity Disorder was featured at the Neurocritical Care Society Annual Meeting in Boca Raton, Florida. Elizabeth Shald, Ishani Patel, Kyle Evans and Michael Finnick completed the review, and Shald received a travel scholarship to present the findings at the meeting in late September. Paroxysmal Sympathetic Hyperactivity, or sympathetic storming, is a nervous system disorder that affects people who have sustained a severe traumatic brain injury. 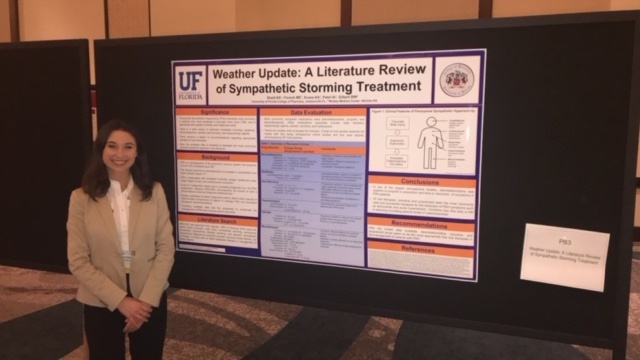 With many treatment options available, and a variety of recommendations regarding appropriate standard of care, the UF pharmacy students sought to develop a literature review that highlights the most common sympathetic storming therapies available for patients. Assisting the study was Brian Gilbert, Pharm.D., BCCCP, BCPS, a 2015 graduate of the UF College of Pharmacy and an emergency medicine clinical specialist at Wesley Medical Center in Wichita, Kansas.